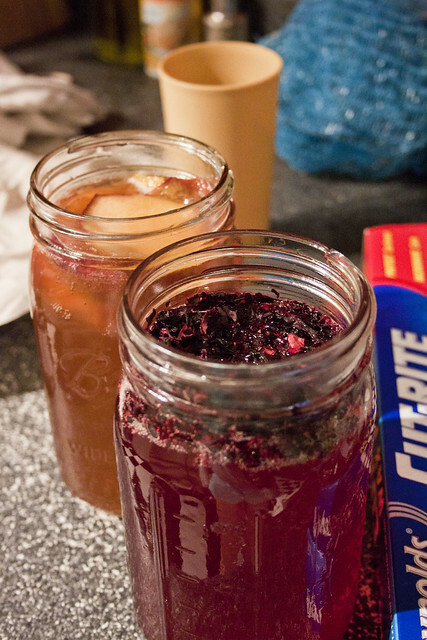 For the uninitiated into what kombucha is, here’s a run down. Last week when I was at my parent’s house for my grandmother’s funeral I mentioned to my brother and sister-in-law that I wanted to try their kombucha. Stephanie, my SIL, had received a ‘mother/SCOBY’ as a present for her birthday. They’ve been happily brewing kombucha ever since! 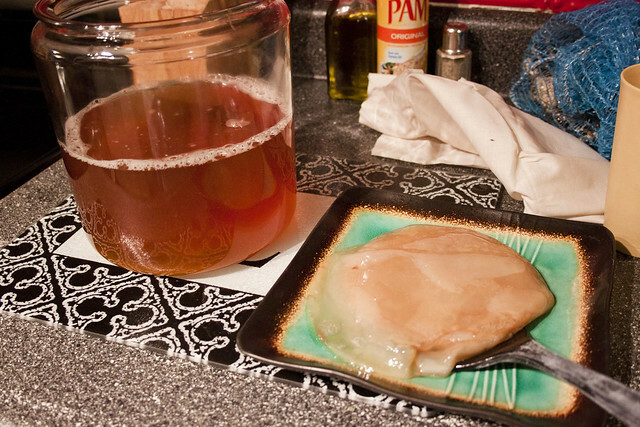 Now the SCOBY has split enough that she could share so I was gifted a jar of fermenting tea and SCOBY. Last night was my night to pour it into Ball Jars and flavor it how I wanted and start a new ferment. I opted to keep the new ‘baby’ with the original mother that was started for this batch until I can get a second jar to have two batches going simultaneously. Of course at 10pm when I was boiling water to get this whole thing started I realized that I was out of sugar! Sugar is what the SCOBY feeds on so I made a late night visit to Walgreens hoping they had sugar, which thankfully they did. Next time I will not do this process at 10pm, it took too long to wait for the tea to cool down, I had to throw it in the fridge and toss a bit of ice in it to get it down to room temperature so I could just go to bed! Anyway, I poured off two quarts of the original fermented batch and flavored that with a peach in one and then hibiscus flowers in the other. I had about a pint left so I poured that off and stuck it in the fridge to sip on while I waited for the flavored ones to ferment for a few more days. Kombucha at the store is on the pricey end and I only get it as a treat now-and-then so I am excited to have my own brew going now! I’m glad my bro and SIL shared! Fascinating- never heard of brewing your own kombucha, and, like you, only had it as an occasional treat since it’s sort of expensive. What other flavors are you going to try? Still not turned on by it!